BRACKNELL, UK. 30th OCTOBER 2017 – Panasonic Computer Product Solutions has recently signed an agreement with PostNL, the largest parcel delivery company in Benelux, for almost 5,000 rugged Panasonic Toughpad FZ-N1 handhelds. Using the new handhelds, PostNL plans to offer customers better and more real-time tracking of their deliveries, from the sorting centers to the delivery address. During the selection process, different devices were field tested by PostNL employees. Taking into account their feedback, the company chose the Panasonic FZ-N1 handheld. Some of the most important factors in determining the choice were scanning speed, long battery life and durability, but in particular the ergonomic design of the device with the angled barcode scanner. 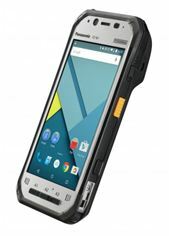 The 4.7 inch Panasonic Toughpad FZ-N1 handheld tablet punches well above its less than 280g weight with a productivity feature packed device in a fully rugged and ergonomically designed package. With its integrated, angled rear barcode reader to protect against repetitive strain and increase productivity, the device can be easily held and operated in one hand. Designed for postal and courier workers, warehouse, retail, manufacturing, field services and emergency services, the device has both voice and data capabilities. It includes the option for both a passive and an active Pen, for more accurate proof of delivery signature taking and boasts a standard battery targeting to offer up to 8 hours continuous operating time and the optional extended battery targeting to deliver up to 16 hours continuous operating time. This lightweight and ergonomic device draws upon Panasonic’s market leading heritage for ruggedness with an IP67 rating for dust and water submersion, plus the ability to withstand drops from 1.8 meters.